You have seen RFID Door Lock Mechanism in some Hotels and other places, where you don’t need a key to unlock the room. You are given a card and you just need to put it in front of a RFID Reader box, and the lock gets unlocked with a Beep and a Blink of LED. This RFID Door Lock can be made easily at your home and you can install it in any door. These Door lock is just electrically operating door lock which gets open when you apply some voltage (typically 12v) to it. Check all the RFID Projects here. The complete RFID Door Lock Arduino Code is given at the end of this project. In the below code, the RFID tag number are stored in the “char tag”. "180088F889E1" is my RFID tag number stored in the microchip of the Transponder. The length of the tag number is 12 we have defined the array like “char input ”, 12 defines the no. of character or size of array. For find the tag no. of your Arduino you can refer this article. Now, in below code, we setup the pins of the Arduino UNO board for the operation and the serial.begin() is used for the serial data transmission. Here the pin 2 is used for the relay operation, pin 3 is for the standby red LED and pin 4 is for the buzzer. The conditional body of the code is void loop() , for the standby red LED the pin 3 remains HIGH until any task performed. We will check if there is any serial data available using the if condition. Means we will check if there is any RFID tag is getting scanned. If any serial data (RFID Tag no.) is coming we will save it in input array which we defined for saving RFID tag number. Now we will compare the scanned RFID card no. with the number which we have defined in char tag array. If both the umber matches then we set the flag variable to 1 and if the wrong card is scanned or both the numbers don’t match then we set the flag variable to 0. If you place right RFID tag, the flag gets equal to 1, in this case the pin 2 goes HIGH (through which a relay operated) and the pin 3 goes low at this moment, after delay of 5 sec both pins will return to its initial condition. Relay will be further connected to Electric Door Lock, so with the relay turned on, the Door Lock will be opened, and after 5 seconds it will again get locked. If you place the wrong RFID card, the flag will be zero and the buzzer start beeping alerting that the RFID card is wrong. The RFID system consists of two components: an RFID tag and a Reader. The RFID tag consist of integrated circuit and an antenna, integrated circuit is for the storage of the data, and an antenna is for transmitting the data to the RFID Reader module. Whenever the RFID tag comes in the range of RFID reader, RF signal power the tag and then tag starts transmitting data serially. 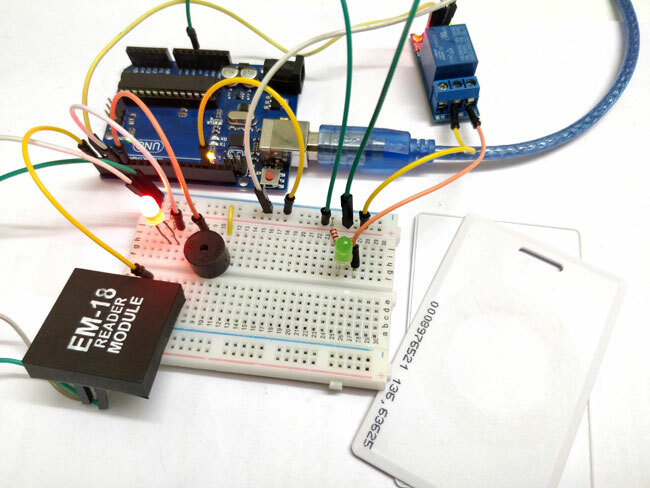 Data is further received by the RFID reader and the reader sends it to the Arduino board. And, after that as per the code in micro-controller different task performs. In our circuit, we have already saved the value of RFID tag in the code. So, whenever that particular tag comes in range, the relay gets activated. Here we have connected a LED with Relay to demonstrate, but this LED can be replaced by an Electric Door Lock, so that whenever the Relay gets activated the lock will be opened. If we scan any other RFID card, the buzzer will start beeping as it’s the wrong RFID tag. Hence, for the door lock system we have used this concept that the door will only get opened by using the right RFID tag. The relay will itself get deactivated after 5 seconds, the door will be closed after 5 seconds, and you can change this delay in the code. Can you ask someone to help me build digital scale with gsm support for beekeeping. It's useful for me to try our group projects.